Huda Beauty Electric Obsessions Palette – I’ve mentioned before of my love of bright coloured eyeshadows, I just don’t do warm natural tones, so when I saw the Huda Beauty Electric Obsessions Palette I snapped it right up! Two of my favourites shades to wear on my eyes are purple and turquoise and this has two of the most perfect shades of turquoise and the prettiest purple you ever did see, I’m obsessed with it. These eyeshadows are so buttery soft, easily blendable and last all day and night. I especially love how easily you can mix and match all the shades. I look forward to adding more Huda Beauty palettes to my collection. Vera Wang Princess Of Hearts Perfume – My wonderful husband surprised me with this perfume for Valentine’s Day, he just knows me so well! I have the majority of the Vera Wang Princess collection perfumes, Vera Wang can do no wrong in my opinion, they’re all sweet, fruity scents which I just love. Princess Of Hearts smells like raspberries, watermelon and vanilla whipped cream, with some floral and citrus notes, it’s beautiful and girly. Probably one of my faves out of the collection. Elizabeth and James Nirvana Amethyst Perfume – I wanted an Elizabeth and James perfume for a really long time and when I got the chance to smell the entire range I was really surprised at want I liked, didn’t like and LOVED. I assumed I would love Nirvana Bourbon because, well… bourbon! But it was only ok. I didn’t like Nirvana Black, which is their most popular scent, I guess it just didn’t blend well with my chemistry, and when I tried Nirvana Amethyst I really loved it. Nirvana Amethyst is a blend of tobacco, cedar, honeysuckle and spices, notes that I wouldn’t usually go for but they all just go together beautifully. It’s such a rich, sophisticated and seductive scent, with a hint of sweetness. Soap & Glory The Righteous Butter 3-in-1 Ultra Rich & Creamy Body Wash – I generally use conditioner when I shave my legs but this stuff is a million times better and you don’t need to use that much. It’s packed with skin-loving shea butter, cocoa butter, sweet almond, grapeseed & macadamia oils and Vitamin E. You clean, shave and moisturise all in one step and your skin is smooth for days, cannot recommend this product enough. 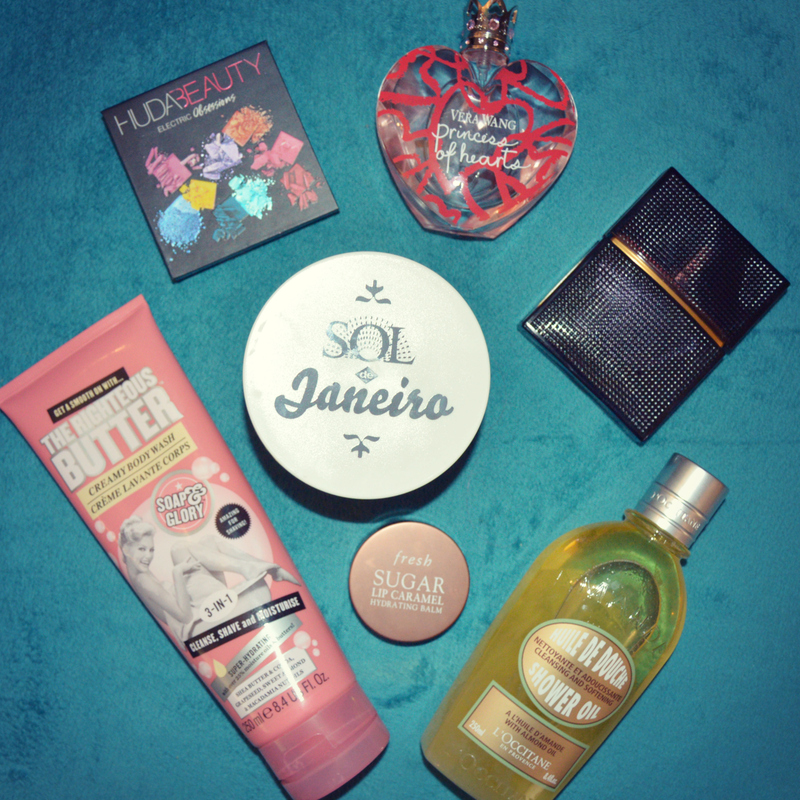 Sol de Janeiro Brazilian Bum Bum Cream – I heard so many great reviews about this so I bought it to see if it lived up to the hype and it really, really does! First of all, it smells incredible and the scent lasts all day, and even though it’s very thick and creamy it absorbs super quick, which I really appreciate. It may seem a little pricey but a little goes a long way and your skin will feel like silk after using it. Fresh Sugar Lip Caramel Hydrating Balm – Y’all know I love my lip balms, this one is my new favourite and I’ve almost ploughed through a pot of it, I’m so hooked! It feels (and tastes) like melted caramel but isn’t in any way sticky, and leaves your lips so soft and smooth for hours and hours, plus it gives them a lovely glossy sheen. L’Occitane Almond Shower Oil – This crazy winter weather has messed with skin something fierce and I’ve been trying to get as much moisture in to it as possible. I love body oils and creams and use them all the time, but I wanted to give this a try as I figured it would be more moisturising than a shower gel and this combined with creams would sort my skin right out. I was so right! It’s a lovely thick oil and a soon as it touches your wet skin it turns into a silky cleanser. It cleans my skin perfectly and leaves it feeling so soft afterwards. It’s definitely given my dry skin the extra comfort and soothing that it’s needed. This is one of the greatest movies I’ve ever seen, if you haven’t watched it yet, you’re missing out. It’s dark, sad, funny, quirky and tense AF! I was on a roller coaster of emotions. The acting in it too is just insane! Sam Rockwell and Woody Harrelson are two of my favourite actors ever, but Frances McDormand is phenomenal in it. I only wish I had balls like her. Kiehl’s Midnight Recovery Concentrate – I had a sample of this in my stash and decided to try it out when my skin was in need of some TLC and I was so impressed after one use I ordered a bottle of it, it hasn’t arrived yet though because of the stupid snow! I used a couple of drops at night time and it absorbed into my skin in a few minutes and left it feeling hydrated but then the next morning I was like “whaaaaaaaat?! Whose perfect skin is this on my face? !” My skin had never felt more nourished, plumped, soft and I was just glowing! I got about four uses out of my sample and it did wonders, now I’m going through severe withdrawal, I need more NOW! Let us know some of your favourites and recommendations in a comment below.